Dmitry Banaev was born in Moscow. He started playing the piano at age four, and at the “Beethoven” Music School at age six. He continued his studies at the Gnesins Music Academy. He graduated in conducting at the “Maimonid” State Jewish Academy. During his studies, he worked as a conductor at the famous Bolshoi Theater of Russia, the Moscow Symphonic Orchestra, and at the Galina Vishnevskaya Opera Centre, and took masterclasses with Riccardo Muti in Ravenna, Italy. 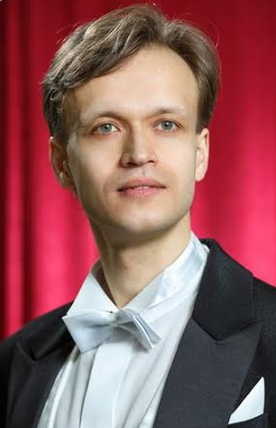 Since 2007 he has regularly performed with the Moscow Youth Chamber Orchestra at the Russian Performing Arts Regional Public Fund, the Moscow Symphonic Orchestra “Globalis”, the Cuban Cossack Symphony Orchestra in Krasnodar, and the Karelian Philharmonic Orchestra in Petrozavodsk. Dmitry Banaev was the Chief Conductor and the Artistic Director of the Chuvash Chamber Orchestra from 2010 until 2011. In 2013 has won the Second prize in The Blue Danube International Opera Conducting Competition, Bulgaria, and the Blue Danube International Opera Conducting Competition, Bulgaria.